Social media insurance. The Visible Banking team invited an insurance customer and social media user to review the American Family Insurance facebook page. You will find below Jamie’s views on the American Family facebook page as of early August 2013. Christophe Langlois and his Visible Banking team invited me to share my personal views on the American Family Insurance Facebook page. I am not a social media expert, so I will share my honest opinion as an insurance customer and first and foremost, as a Facebook user. Just like anything else, the first thing you would notice when you visit a website or page is its general design. As for the general design of American Family Insurance Facebook page, I would say that it’s very simple. The About section contains the history, contact info and mission of the company. Facebook users who prefer a more elaborate design may find it boring and immediately close the page upon seeing it. The company should put more effort on the design of their Facebook page. People want stuffs that can catch their attention at first glance, so I think the company should consider this point. 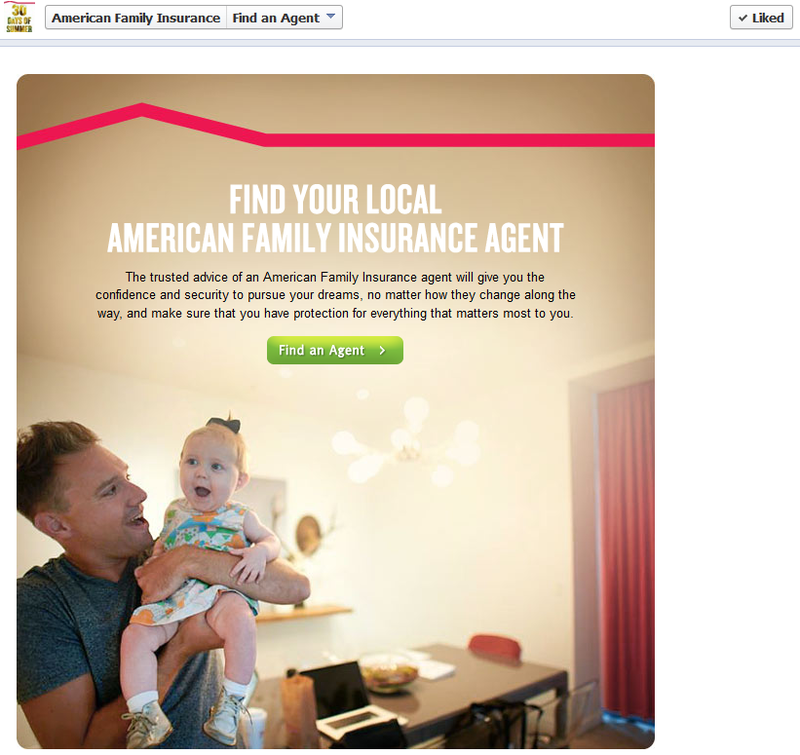 What I like most about the American Family Insurance Facebook page is that it did not focus solely on social media insurance or social media banking, but also shared other topics and links. #‎30DaysOfSummer, for instance, involved posts about the things that can be done during the summer season. The photos that come with the posts surely make it more appealing and engaging, especially the ones with kids and families enjoying the season together. Videos are also posted including the one about 2013 American Family Insurance Dream Camp winner Robin Coalson who hopes to become a world-class master wood carver. The company did a good job of getting users more connected with them through their posts. The American Family Insurance Facebook page is open for user comments, but the company stated that it does not allow defamation, profanity or other hateful comments. It also included some guidelines for fans to follow. What’s good is that the company responds to the comments or concerns of users, which is a good thing. However, it mostly includes sending their concerns to the email add provided by the company. As a customer, how can I make sure that they would respond to my concern? On the other hand, responding to their customers is still a great job on their part as consumers are assured that they are not ignored. And now, I will talk you though my views on the apps. This app enters users into a drawing to win an ADT security & home management system. Users are only required to fill up the required fields for them to join. The system can help keep your family connected and safe, but since not everyone can have it, I’ll give it an 8 out of 10. The reward may be extremely appealing, but it’s still a contest where the winner takes the prize while those who did not win need to wait for another opportunity to get their sweet victory. 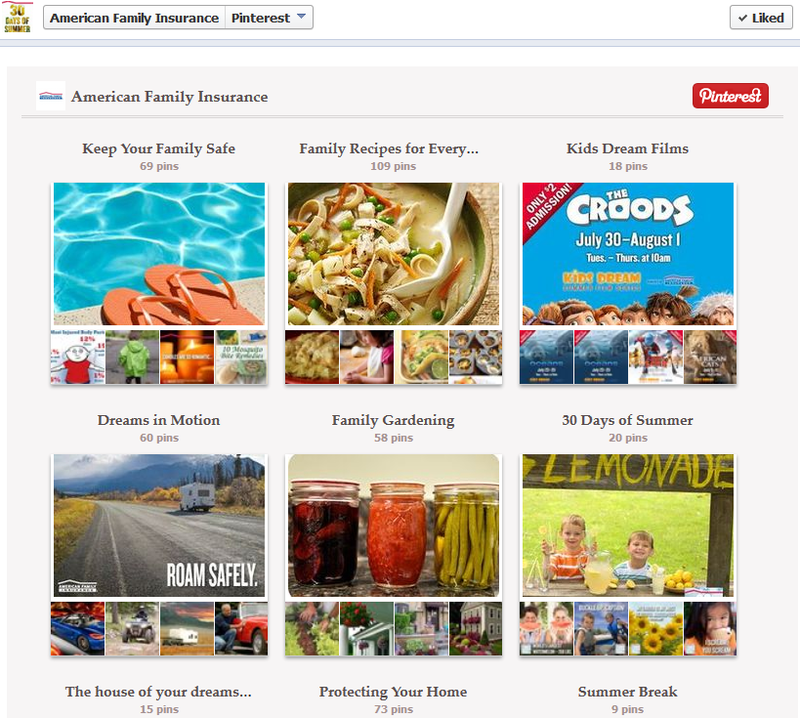 It just shows the upcoming and past events hosted by the American Family Insurance. It is beneficial for those who want to know the past, present and upcoming events of the company, but not all users spend time to browse every tab. However, I still think it deserves to get the score of 7 out of 10. 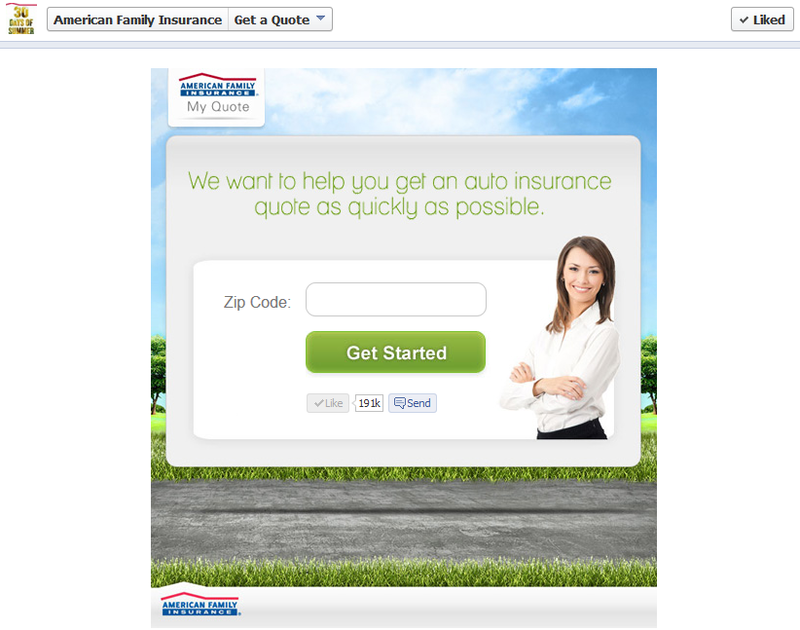 For those who want to get an auto insurance quote fast, the American Family Insurance Facebook page also provides it. All you have to do is enter your area’s zip code and click the Get Started button. I think this app is great as it helps users get an insurance quote as fast as possible. However, you can’t purchase an insurance product on Facebook, which may be a bit cumbersome for those who want an all-in-one app. For me, it deserves to get the score of 7 out of 10 as it is still beneficial for those who want to get a quote fast. This app is a great help for those who want to find a local American Family Insurance agent. However, nothing comes out when you click the Find an Agent button. So, if I’m going to rate it, I’m giving it a 1 out of 10. This app is a tool for collecting as well as organizing things you love. The photos may look interesting, but to find the information you need from these pictures, you have to put some effort and patience clicking them a few times. For instance, if you click Family Recipes for Everyone, several photos will be shown and when you click one of these, you’ll be taken to Pinterest’s main page. However, the work doesn’t stop there. A link will appear once you place the cursor on the photo and you have to click it if you want to get the information you need. Pinterest may be useful for those who want to find other interesting stuffs on Facebook, but there’s really no need to find them on the site. Some of the photos are not completely related to the products offered by the company. I’m giving it a 5 out of 10 since these photos would not impact my views on the brand. I would still look at the benefits I can get from the American Family Insurance. It’s an online tool that allows you to make an inventory of items in your home. In case of unexpected events and you have to make an insurance claim, you can make a report of your inventory with a click of button and email it to your agent. The app is available on computers as well as iPhone and Android devices. 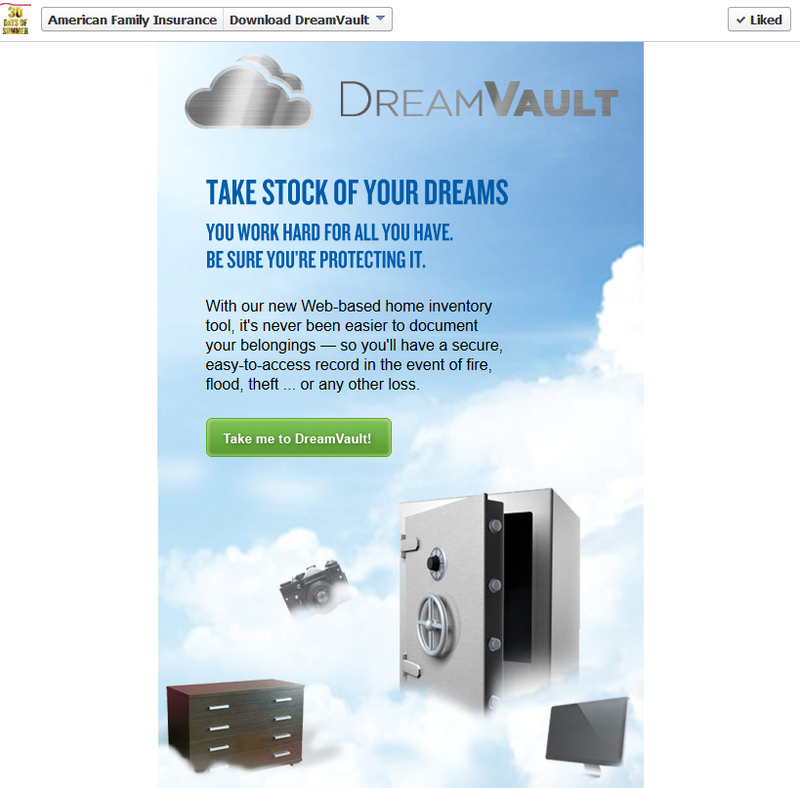 You’ll be taken to the app’s main page once you click the Take me to DreamVault button. To use it, you have to download the app. I’ll give it a 7 out of 10 since it’s not like you have to check your inventory every day, but the app is still useful as in the event of a claim, you will have peace of mind knowing that you have a record of all your stuffs. As an insurance customer myself, I am more interested in financial institutions that can be found on social media sites like Twitter and Facebook since communicating with them will be easier. I especially liked the Get a Quote app. By using it, I can prepare the amount I have to spend for the insurance product I will get. I don’t find the Find an Agent app unnecessary, but I think the company should take some action to fix it as soon as possible. 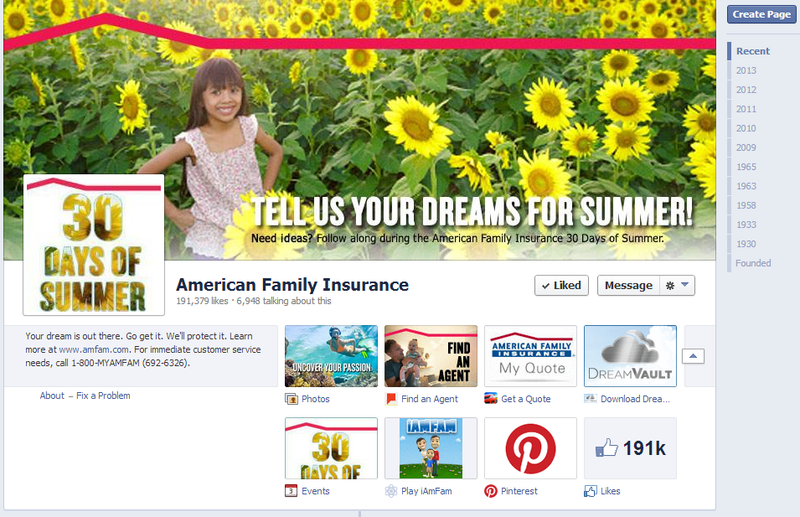 Overall, the American Family Insurance did a great job of creating an interesting and engaging Facebook page. I’m giving it a 7 out of 10, and I would highly recommend this page to those looking for a financial institution that considers the interest of its customers first above anything else. Jamie is a 21-years old foreign student in the US. She is a moderate Facebook user who uses her Facebook account at least two times a week to find good content, stay updated with the latest news and chat with her friends back home. In my opinion, American Family is one of the insurance firms the most committed to successfully engage with their customers on social media: they empower their insurance agents, they innovate with initiatives like ‘iAmFam’ -their virtual game a la ‘the Sims’ (which Jamie forgot to review here unfortunately…)-, they put in place some smart partnerships to tap social media channels like Pinterest, and even their President is on twitter. Have you visited the American Family facebook page? If so, do you share Jamie’s views? We invite you to tell us what an insurance firm like AmFam should do to successfully engage with you on facebook. Join the conversation here or on twitter.